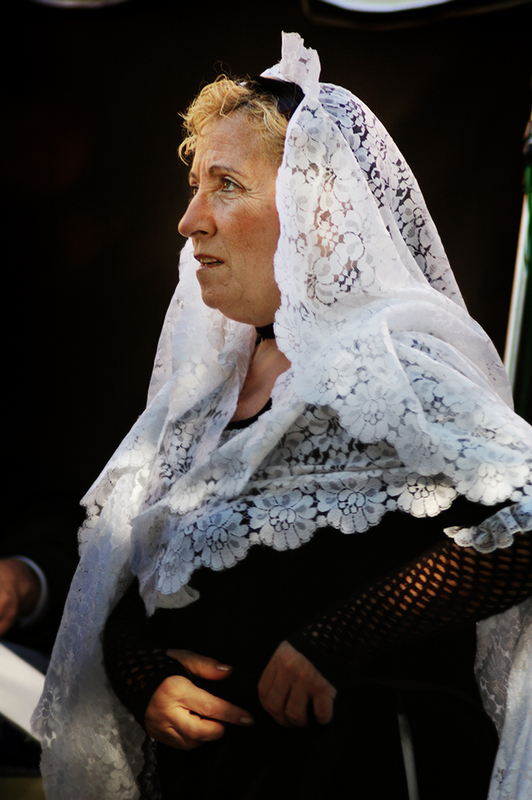 A Catalan woman wearing the traditional dress. You should know that there are some differences between the traditional garment and a pubilla's dress. But what is a pubilla? Long ago, Catalan families with no male descendants considered the first daughter as the heiress in the family. In case there were more sisters, she kept three fourths of the family's patrimony. So an heiress is called pubilla and the male counterpart is called hereu. Pubillas helped preserved the family's last name in case of not having a male descendant. At present the pubilla tradition is kept in Catalan towns just for cultural purposes. Some towns elect their pubilla among young ladies (pubilla derives from puberty) who are to act as representatives of Catalonia's culture. Pubillas can only be elected once and during one single year to yield the position to other ladies. Both pubillas and hereus are accompanied by maids of honor and fadrins (brothers that are not heirs) respectively. I am not an expert on this matter but I would say this is just a traditional dress, age factors aside. A pubillas's dress is made of a more expensive fabric and shawls are made of a more elaborate lace. They wear shoes and not espadrilles although both the traditional and the pubilla's way of dressing include the elbow length fishnet gloves and the hair net.